Whether in the form of a house, cookie, cake or bread, gingerbread is essential to the Christmas season. The sweet dates back thousands of years to Europe, when it took the form of a dense spiced cake made for special occasions. Ingredients varied in different countries, with ginger being the most important element. Almonds and citrus fruits, honey, bread crumbs and even wine were among variations. Gingerbread often took the form of people, the sun, moon, flowers, birds or other animals. Gingerbread houses probably first came about in Germany, where gingerbreads -- called lebkuchen -- were traditionally the province of master bakers. At Christmas these bakers would shine, designing intricate houses and cakes. Modern gingerbread typically includes maple syrup or molasses and dark brown sugar. Fresh or crystallized ginger may be used, with spices such as cinnamon and allspice. The Kemoo Farm Happy Cake has been around for nearly 40 years and is still going strong. Although ownership of the historic Wahiawa company has changed hands since it was founded in 1916, its signature pineapple macadamia nut cake remains a holiday staple. Large chunks of Hawaiian pineapple and crunchy macadamia nuts fill the 2-pound cake. Also available are a pineapple cake sans nuts and a rich chocolate macadamia fudge brownie cake. The cakes are made at Kemoo Farm, vacuum-sealed, packed in a tin, then placed in a sturdy box decorated in red-and-white hibiscus. The box is designed for shipping. 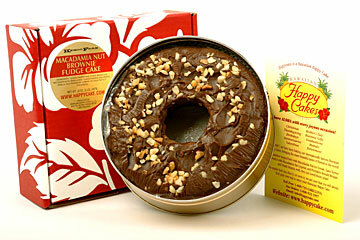 Cakes sell for $30 at Na Mea Hawaii, Hilo Hattie's, Hungry Lion Restaurant or online at www.happycake.com. The cakes are available year-round. Kemoo Farms is planning to add smaller cakes and increase distribution to other stores next year.